The two women turn unattractive, raw sheep pelts into beautiful, white, fluffy rugs. Climbing the barn ladder leading to the loft above, the women found the floor covered with sheepskins. Many of them were deteriorating and going to waste in the warm and dirty mow. The hobbyists thought it a great shame to see the pelts waste away, so asked the rancher the reason for not shipping them to market. The two women then asked the sheep rancher, if he had ever tried tanning the pelts for rugs. A bout a week later, as the two women sat sewing in the home of Mrs. Dittmeyer, they were startled by the sound of a truck roaring into the yard. As the horn tooted impatiently, the two hurried to the door and out onto the back porch. Their friend Welborn climbed down from the truck and came up the path to greet them. “All right girls,” he said with a smile, “I’m tired of seeing you chewing your fingernails, for lack of something to do. There they are, now see what you can do with them.” The back of the truck was piled high with sheep pelts. After doing a little research on the tanning of pelts, the women found they would need some oxalic acid and some sulphuric acid. Next, the hobbyists bought two half barrels, which were to be converted into vats. They were then ready to tackle the job of actually working upon the pelts. First, they removed the fat and membrane from the pelts with a knife, and then washed them in soap and lukewarm water. After the pelts were cleaned thoroughly, they were rinsed and submerged in the first solution, consisting of five pounds of salt dissolved in ten gallons of water, plus two ounces of sulphuric acid. The pelts were kept immersed in this bath from three to six hours, and then were ready for the second solution, which was made up of one pound of oxalic acid, and five pounds of salt dissolved in ten gallons of water. The sheepskins were kept in this mixture from thirty-six to seventy-two hours, and then rinsed in soda water. The pelts were then stretched on plywood frames, with the skin side out and allowed to dry. To hasten the drying process, the women rubbed the pelts and added talcum powder to soften them. When the skins were dry, they were removed from the boards and the extra long hairs were trimmed and clipped from the edge of the pelts. The final task consisted of combing the pelts and making the hair soft and fluffy. A few days later, Welborn stopped in to see how the women were getting on with the pelt tanning. The hobbyists could hardly wait to show him their first finished products, so immediately displayed one of the beautiful white, fluffy rugs before him. A number of other pelts were treated and tanned in the vats, and each proved to be more beautiful than the one treated before it. About this same time, a neighborhood trading post was built near the town of De Ridder, and the manager asked if the women would be interested in trading finished rugs for raw pelts. The trading post dressed its own lambs for sale and the pelts were usually destroyed. The women agreed to terms that proved beneficial to them, but were not prepared for what actually was about to happen. Traders at the post were fascinated and highly delighted with the sheepskin rugs, and wanted to know who made them. When they learned that Mrs. Dittmeyer and Mrs. Graber were the creators, they wanted rugs made exactly like those they saw. Soon many persons from the surrounding countryside were bringing their raw pelts to the women to be converted into pretty, white, fluffy rugs. The women figure that most of their raw pelts cost them about $1 each, and the finished rugs sell for $8.95 and up. Some of the skins are not received in a perfect condition, so a lower price is charged for the finished product. One day the women received word that Beauregard Parish County, was holding its annual fair within a few weeks. They decided to enter their rugs at the fair, but when the day of entry arrived, the authorities couldn’t find an appropriate booth in which to display them. As one of the men on the fair committee went from booth to booth in search of the proper place of showing, visitors to the fair gathered about him and admired the white, fluffy rugs. 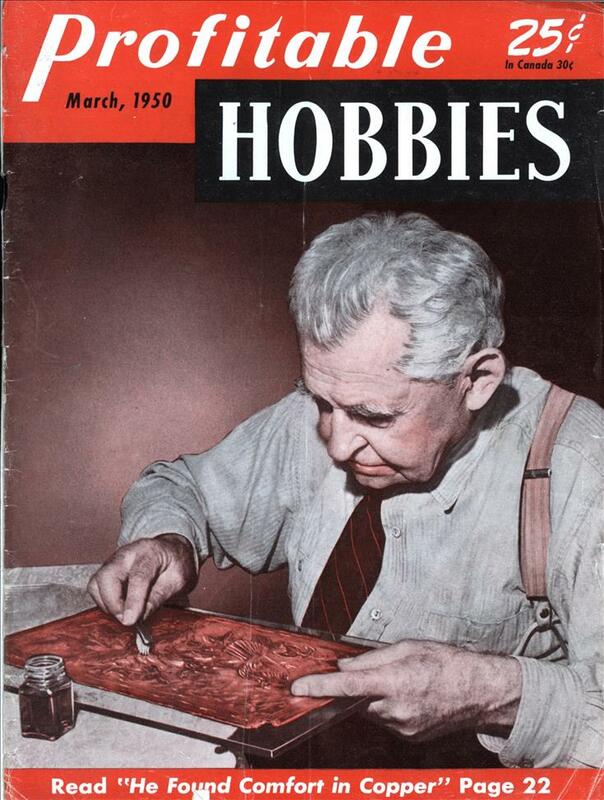 Soon after the fair was held, a hobby show was sponsored in Alexandria, Louisiana. 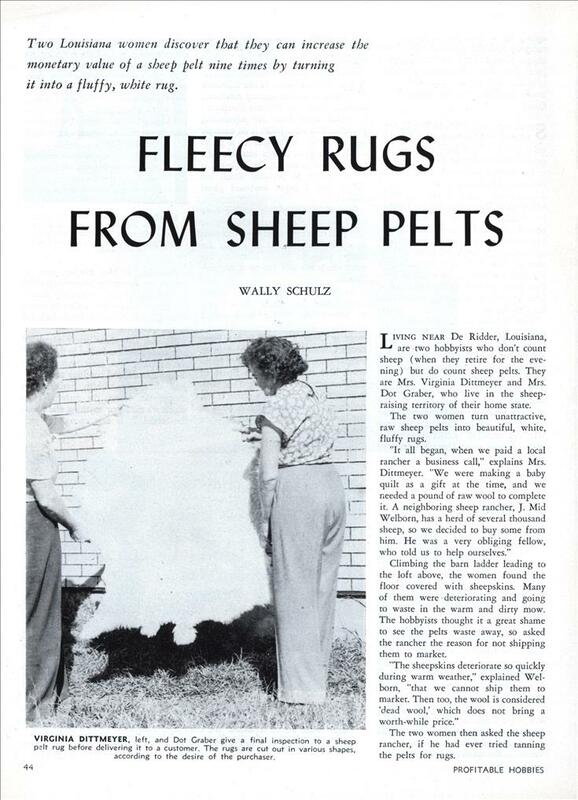 A home demonstration agent encouraged the women to enter some of the sheep rugs. The sizes of the rugs vary according to the age of the animal when slaughtered, and there are no two rugs exactly alike. The length of the pelts ranges from forty-eight to fifty-four inches, and the width ranges upward from twenty-eight inches, depending upon the way they were trimmed. “We both like the natural shape of the animal skin with part of the belly skin showing,” Mrs. Dittmeyer says, “but many of our customers prefer the oblong or round rugs with no sign of the animal form present. “In choosing a rug, however, a lot depends on where you plan to use it. If the rug is going to cover the floor in the bedroom, it wouldn’t make much difference what shape you choose, but if the rug is going to be used in front of the fireplace, or beneath the coffee table, the animal form usually seems more appropriate and becoming. “Dot has a large living room, where we do a lot of our work,” says Mrs. Dittmeyer, “so we drop our finished rugs over the back of the divan, under the coffee table, and drape some over the chairs and other furniture. This gives our working quarters a ‘homey’ atmosphere—ranch fashion, you might » say. It takes the women about a week to complete a rug, and sometimes it takes longer. This doesn’t mean they work a week straight, but off and on, on several rugs at a time. It all depends on the weather, for it plays an important factor in the drying process. Several rugs, however, can be made at the same time in the same solutions. One night the two hobbyists were working rapidly on a rush order which was to be completed that day. As they were busy brushing and combing the hair (trying to beat the deadline) there was a sudden knock upon the door. One of their customers values her rug so highly that she doesn’t let anyone walk upon it, for fear of getting it soiled. Another woman drapes her rug over a cedar chest and prevents it from getting scuffed or marred. One day a friend of the Grabers came to pay them a call, and was impressed with the sheepskin rugs that decorated the room. It happened that he was a salesman, and he volunteered to take the finished rugs on with his line of goods. Through him, the women have received a number of orders. Their future plans include displaying their rugs to tourists at a nearby lake resort.